The LLV Barreled Upper has been completely redesigned since 2011.... Better balance, more versatility, and even better accuracy! A hard anodized CNC machined billet receiver is the foundation of the lightweight LLV setup. The complete barreled receiver (aka Upper) weighs under 15 oz! 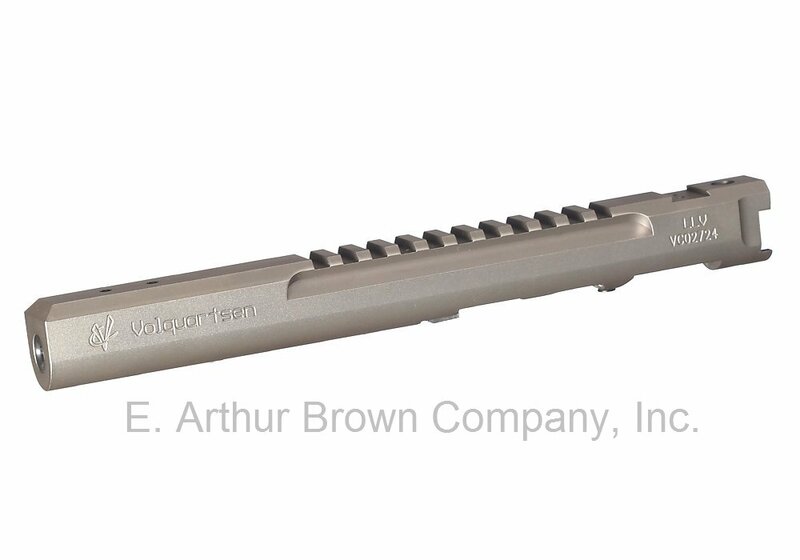 The receiver and barrel shroud are precision machined as one piece from aluminum alloy. An integral Picatinny Rail is machined into to top of the receiver. It is then fitted with a 6" precision barrel that has been machine honed and lapped. The barrel has been contoured to reduce weight without sacrificing accuracy. The Volquartsen LLV Upper will transform your Ruger Mk II or Mk III into a whole other pistol... And you can convert it back anytime. Order Your's Today! Please Note: LLV barreled receivers are actually serial numbered uppers that require FFL transfer paperwork. When you order, download your dealer FFL or ask that dealer to FAX (320-834-3002) or email ([email protected]) a copy of their FFL to us (EABCO) along with your name and order number. We'll ship your order to your dealer where you can go and pick it up. We are not able to ship this item to California or Washington D.C.